I have been using the Clarisonic Mia 2 for the past year, and so far my Clarisonic Mia 2 in pink has been holding up pretty well! It has definitely made me more meticulous with my skincare routine. You can view all the entries that I wrote about the Clarisonic Mia 2 here. I posted my first entry on the Mia 2 exactly a year ago! For me, the Clarisonic did not break me out. I have used 2 different brush heads before- the delicate and the normal one. I actually don't think they are drastically different, and I can't feel any significant difference on my face either. Since these two types of brushes work pretty well for me, I won't be trying out the other brush types for the time being. I use the Clarisonic only at night for a deeper cleanse, and only every other day. It helps to exfoliate so I don't use facial scrubs anymore. That is the most distinct change in my skincare routine! The charge can last for about 1 month for me, which is great. However, I usually charge the Clarisonic before I travel so that I don't have to bring the charger with me for short trips. One of the qualms is that there is no indicator on how much battery there is left, so it can get a bit confusing to keep track of the time between charges. I change the brush head every 6 months. The recommended time is 3 months, but since I don't use mine everyday, 6 months is sufficient. Even after 6 months, my brush head looks as good as new. One tip that I would suggest is that taking good care of the brush head is really important to maintain it in top condition. I usually wash the brush thoroughly after each use, and remove the brush head from the Clarisonic to let it dry separately. I usually don't keep my Clarisonic in the bathroom as it's extremely humid inside, so this helps the brush to dry quickly between uses too. 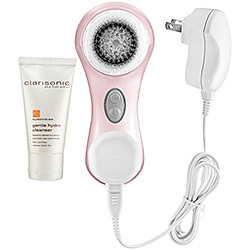 The Clarisonic Mia 2 is definitely a good investment as it is very durable and helpful. I remember spotting the Mia 2 recently at Sephora for a lower price compared to the price I paid last year. However, Mia 2 is only available in white for the Singapore Sephora as the pink one I bought was a limited edition.